By The Glass operates worldwide, with distributors in 41 countries, and growing! 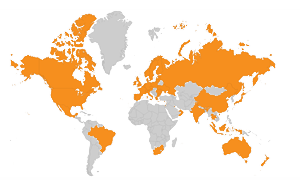 Each country with a distributor is highlighted in orange below. Click on a country to visit the distributor’s website. Shaked House 40 Aluf David St.